We are living in the age of Selfies, aren’t we? Before anything else happens we take a selfie – at a mall, in your balcony, in your bed, washroom, and I don’t know where all. I myself am party to it. Some of my cousins say I am obsessed with selfies!! Like really??? I know girls who take 69 washroom selfies at a cinema!! I am much mellower than that. At least I post much lesser than what I click. LOL. Just a few days back someone said in our family whatsapp group I should be named Selfie Tina. It made me laugh actually. It sent me thinking for sometime. The more I see my son posing for selfies at 8 months the more amazed I get. The moment you hold the phone in front of him he knows it’s time to pose! He is a camera friendly baby. But his mom hasn’t been like that always. If you see photos of mine from my childhood you’ll be surprised to see a kid who’s always sulking. I hated cameras, I hated flash, I simply hated the idea of gathering together and posing for photos. During my childhood, we used to have these photo sessions at home. My dad has a friend who is a famous photo journalist and we have had many photo sessions with him. 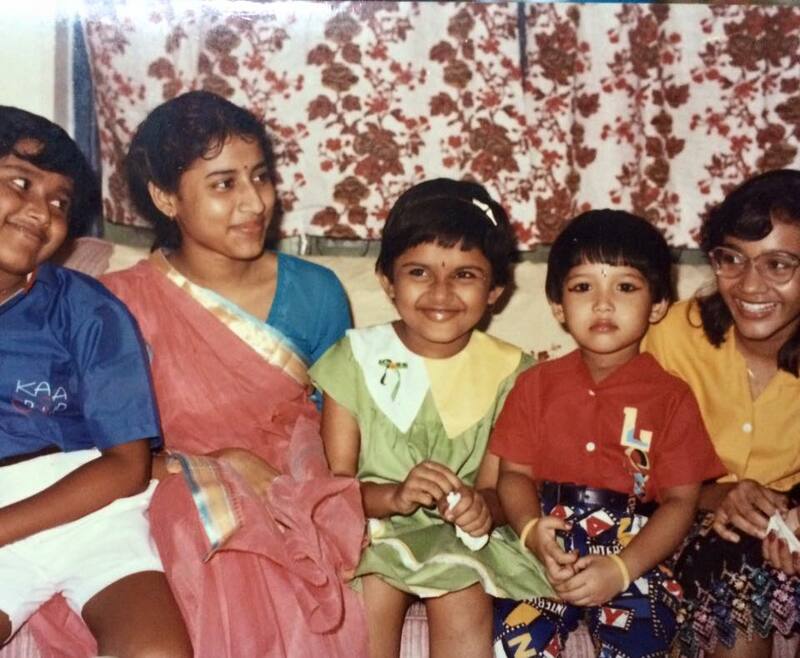 I was probably five or six when one Sunday we were all dressed up for one such photo session. I particularly was not happy how my mum had dressed me up. I hated kajal, I hated jewellery, I hated stockings. I don’t know why but I just can’t stand stockings at all. I was not happy with any of the outfits I was made to wear. Then came the torturous lights, quite a nightmare for me. All other cousins were super happy and excited about the photoshoot. They all loved posing and dressing up. And there I was sulking in all the photos, which was enough to face some wrath from my mom later. But if you follow me on Instagram now or on FB you’ll know how much the little camera shy girl has come across. I still don’t know why I used to sulk in all photos in my earlier days. But my bub ain’t camera shy! Here’s mom and son – Same Place, Same Photographer and Same toys!! he hijacked my teddies!! This post is written for the A to Z Challenge 2016 for Day 3 Letter C. Visit A to Z, BlogChatter to read other beautiful bloggers! « #AtoZChallenge 2016 Day 2 – B is Braving the Bumble! I'm not a selfie person. The few I've taken, I think look horrible, so I don't do it often. Tina, I totally get it. If anything has embarrassed me to the core in my wedding is the photo session. I hate posing to the camera.Of late, the story is changed a bit and my friends claim that I have turned a selfie freak. I see the craze dying out again. I can't do selfies without looking cross eyed so I tend to avoid them. Besides, my arms are really short and all in all I hate selfies. But it is an art I have to admit. I recognised the solemn girl even before you revealed your identity and am glad that your little baby loves the camera. Just wait till he starts actually looking at himself and trying to "edit" his poses….. Taking selfies is an art form, for sure! You have to be able to figure out th right angle and lighting and all of that! how I can relate to the turn around from camera shy to camera loving person. Haha so cute photo . I also take lots of selfies 😒😒 an am working on avoiding this habit now. Due increased addiction . It’s funny, you know…there was a time that I can remember (because I’m sort of old), when one didn’t have to ever worry about appearing in front of a video camera if they didn’t want to. It was easy to be camera shy, because not that many people had cameras to stick in your face. Nowadays, video cameras are everywhere.Like anything, being comfortable in front of the camera takes practice. If you want to overcome the nerves, then you just have to get in front of the camera as much as possible. If you’re in any way involved in new media, chances are you’ll eventually be put in front of a camera. By taking a few simple steps and of course, practicing, you’ll feel more comfortable as time goes on. Who knows, you might even start to enjoy it! He's a born poser. Clicks selfies at 8 months!! Thanks Kala. D will be delicious too! hahaha the first picture does say how much you have camera. The second one is so cute. You have saved all those toys too. Brilliant!! I have never been too shy in front of the camera. Used to be a bit formal when I was a kid, but I have become more casual and candid now. Haha.. Kids today. They are so camera friendly. My niece, she can beat a model right away when it comes to posing. And I am not talking about the pouts and poses, it's about the way she stands and touches the wall. Oblivious to what she's posing, the photos look really seductive and mind you, she's just 5! Yes, these days kids love being clicked. I have noticed that .. many of my nephews and nieces have a thing for cameras and they nicely pose when someone waves a camera phone or camera in front of them. This is the new gen huh! You looked pretty when you are young.. Cute!